Sarath Amunugama entered the Ceylon University, as it was then called, in 1957. This was the heyday of University education in this country when there was a fusion of academic excellence and a creative national consciousness. It was home to a superb teaching faculty which could be compared with the best in the world. The Peradeniya library was one of the best in Asia and its librarians the envy of other academic institutions. Forward looking ‘Peradeniya culture’ had become the dominant mode in the country, thanks to a large number of graduate teachers who had fanned out to all parts of the country. Sarathchandra’s play ‘Maname’ had taken the country by storm and had drawn the admiration of even the Sinhala traditionalists who had looked upon his influence with suspicion. In the field of Sinhalese literature, in addition to the writers living in Peradeniya like Sarathchandra, Siri Gunasinghe and Gunadasa Amarasekera, a whole new generation of young writers elsewhere, particularly those in the media, were following developments in the University eagerly. There was an aura of learning as well as a love and romance associated with Peradeniya which only those fortunate to be there at the time would recall. “I always joined little gatherings of undergraduates who were aspiring to be poets. One evening, seated under the flamboyant tree that was heavy with deep-red flowers, Sarath Amunugama talked about the power of rhyme and metre, their ability to nourish the human mind. He was reading for a sociology degree, yet he knew so much about poetry. Some of the poems he had composed appeared in the university students’ magazine that year. To illustrate what he was talking about that evening, he brought in an example from English literature. He recited Shakespeare’s famed love poem”. “He is in love. No wonder he brought this example,” whispered Paddy in my ear. I didn’t like to be distracted. I was too absorbed, too eager to learn the power of poetry”. “Shall I compare thee to a Summer’s day? Thou art more lovely and more temperate. Rough winds so shake the darling buds of May, And Summer’s lease has all too short a date.” “It’s the rhythm of it that takes you to the next line,” said Sarath, looking admiringly at his girlfriend, who was seated facing him in the front row”. 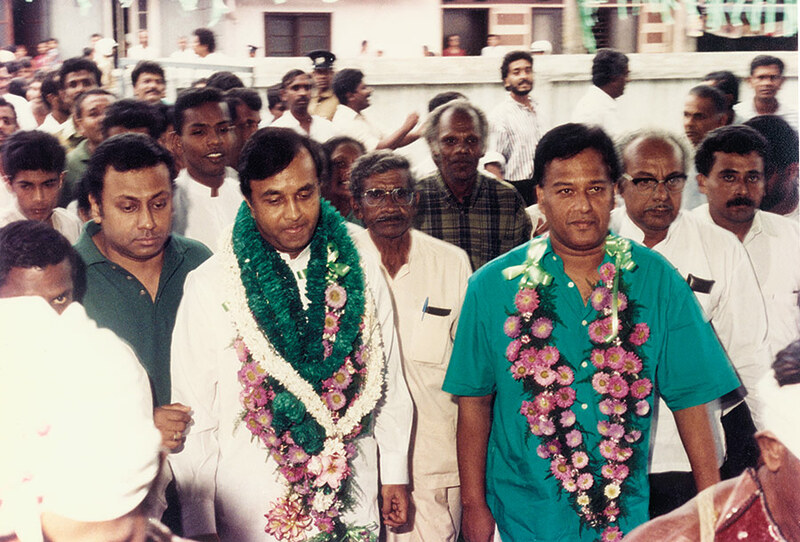 Politically Amunugama was a radical, having associated himself with the LSSP. As sympathizers of the LSSP, a select group of students would follow the brilliant weekly political teaching on Marx and Trotsky by Doric de Souza, held off campus in a rented hovel in Hindagala. These discussions were followed by periodic lectures by Colvin R de Silva. Such meetings had an indelible influence on Amunugama who was fascinated by the then USSR, Eastern Europe and Red China. He read widely on these subjects and never missed an opportunity of visiting those countries. As children, however we far preferred his visits to the West because he would come back with the latest clothes and toys while visits to communist countries meant a return with a suitcaseful of unreadable books. The University Trotskyites elected Amunugama as the General Secretary of the Economics Society. In that position he came into contact with N.M. Perera, Bernard Soysa and Anil Moonesinghe, who later became a close friend. Elected as President of the Union Society by the undergraduates of his time, he led a strike which compelled the ‘Iron Chancellor’ Sir Nicholas Attygalle, to negotiate with him regarding the rights of students. As Daya de Silva writes: “Sarath Amunugma, admired for his extremely good looks and the leadership qualities, was a student of sociology there. He served as the President of the Students’ Union in our very first year. After serving the country as a member of the elite Ceylon Civil Service, he now has joined the national political arena”. Another new experience resulting from his close association with Sarathchandra, was the introduction of many important cultural figures of the time to Amunugama. Martin Wickremasinghe was a frequent visitor to Peradeniya, partly because his daughters were studying there. Other literary figures such as K. Jayatilleke, Madawala Ratnayake, Gunasena Galappatti and P. Nissanka were part of the Professor’s entourage. Celebrated personalities like W. D. Amaradeva, Dunstan de Silva and P. Welikala were also regular visitors who took part in the cultural events on campus. But the most popular event every year was the long awaited visit of Ravi Shankar arranged by Dunstan. His sitar recitals would go far into the night in one of the halls of residence. Later as a civil servant in charge of the Broadcasting Corporation, Amunugama arranged for top Indian artists like Ravi Shankar and Nikhil Bannerjee to play for local audiences. Even popular singers like Mohammed Rafi and Mahendra Kapoor were brought over by the SLBC. Amunugama participated fully in University activities. Not only did he take part in competitive sports like athletics and cricket, he also played an important role in the cultural and intellectual life on campus. He played “Katchaputa” in Sarathchandra’s play ‘Kadavalalu’, and produced the Sanskrit classic ‘Ratnavali’, which was staged for the first time in the celebrated ‘Wala’ on campus. Together with Siri Gunasinghe and several young poets like H.L. Seneviratne and Wimal Dissanayake, he edited ‘Nisandas’, a path-breaking poetry journal. With President Mahinda Rajapaksa on the campaign trail. 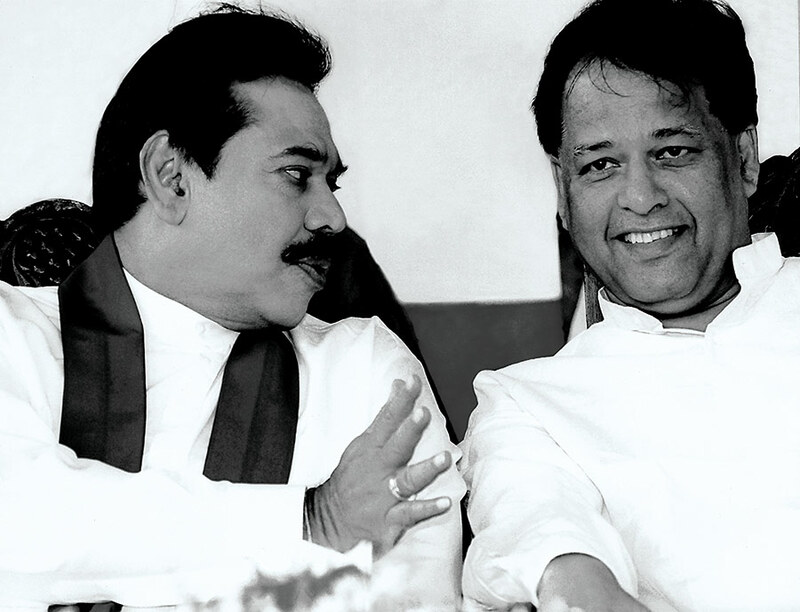 On electing to follow an honours course in Sociology, he came under the influence of leading social scientists with global reputations like Ralph Pieris, Stanley Tambiah, Gananath Obeysekere and Laksiri Jayasuriya who taught in Peradeniya at the time. It is a period which he most enjoyed talking about. The intellectual stimulation and sense of comraderie in the fledgeling Department of Sociology made him a lifelong believer in good residential university life, which he tried to encourage during his short stint as Minister of Higher Education. Gananath Obeysekere decribes the fieldwork undertaken at the time. “Friendship such as ours were cemented in the course of fieldwork, living in village huts and eating together, sharing gossip and laughter and drinking kitul toddy that, going back to my unreal nostalgia, tasted like champagne. I remember Sarath as one possessed with an infectious sense of humor, somewhat irreverent and cynical, a kind of attitude that many of us shared. But beyond that we were all thrilled with the sense of discovery about life in the two villages we studied, as if we were going back in time to our own families who were also once villagers like those we were living with. I will now say this about Sarath: through the long years that I have known him he still retains that infectious laugh and time has not stilled the sense of what I will call “creative irreverence”, including the capacity to laugh at ones own self and of course deflating pomposity in others”. Campaigning for the DUNF with Gamini Dissanayake. Graduating with honours in Sociology, Amunugama was for a brief period a Lecturer in Social Anthropology at Peradeniya University. He was easily one of the best students of his time having worked hard with Tambiah and Obeysekere as a research assistant in studies of kinship and land tenure in Laggala in the Matale district and Hiniduma in the Galle district. This intensive fieldwork stood him in good stead when he later functioned as a Government Agent. On leaving the university after four enjoyable and eventful years, Amunugama passed into the prestigious Ceylon Civil Service, coming second in a batch of eight recruits. The CCS was undoubtedly the elite administrative group of the time.